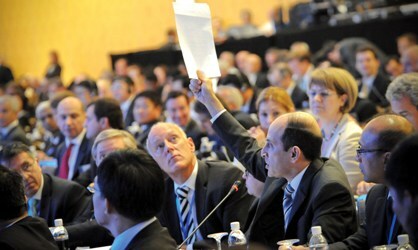 SINGAPORE – Qatar Airways Chief Executive Officer Akbar Al Baker sparked off a tense debate about the structure of airline industry body IATA and its finances during a conference of airline bosses in Singapore this week. In a dramatic early session of IATA’s annual general meeting, the International Air Transport Association came under fire for appearing to be “run for the few, by the few” and lacking full transparency. Al Baker led a vocal onslaught by a number of international airlines over IATA’s failure to show clear transparency in its processes. He questioned the auditing process for IATA’s 2010 financial statement, and later questioned the “surprise” nomination of Etihad Chief Executive Officer James Hogan to fill the extra seat created to broaden the representation of carriers from the Middle East on IATA’s board. Al Baker highlighted some of IATA’s expenditure, including US$18 million on travel, US$58 million on data processing and IT and US $29 million on outsourcing and consultancy. He called on IATA to justify “such large sums spent on travel” and the processes by which consultant and outsourcing contracts were awarded. Al Baker backed a motion for IATA to reconsider the appointment of its auditors, having been unconvinced about the industry body’s financial accounts and auditing process.